Decorated with a floral Tree of Life. 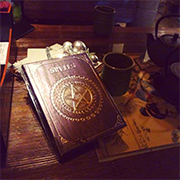 Channel your inner peace with this mystical Leather Journal, available as a part of Nemesis Now's Premium high-quality wholesale alternative giftware selection. Bound in brown leather, the book comes with two metal clasps, keeping it from falling open unexpectedly. The cover is embossed with a large Tree of Life at the centre, this surrounded by Celtic vine designs, alongside the words "Dream Book". Symbolising nourishment, transformation, sustenance, spiritual growth, union and fertility. Inside, high-quality plain paper gives you the freedom to record your thoughts and dreams unimpeded.